I’ve been drinking a lot of green tea lately on account of fighting off a cold. Why do I do this every time? I’m not really sure! Does it really help or is it the placebo effect (and does that matter)? I know fluids are important when sick, and green tea can help with that, but mostly you hear about green tea as it relates to weight loss and cancer. So what’s the truth? Health benefits– Green tea contains epigallocatechin gallate (or EGCG) which is an antioxidant. It is thought to help prevent the spread of cancerous cells and possibly the development of cancer. Some studies have also found a link between green tea consumption and decreased risk of heart disease. There are some promising studies out there, and some not so promising, so it’s too soon to say for sure, but so far the results do look good. Fat burning– Green tea gets a lot of publicity for its implications in speeding up the metabolism and potentially promoting weight loss. While studies have found a spike in metabolism after consumption, it is probably not enough for any significant weight loss. 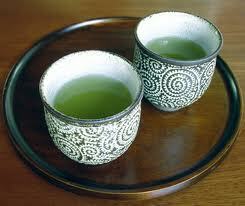 On average, drinking 3-4 cups of green tea was found to increase calorie burning by 80-179kcal/day. Although this could help augment a weight loss program, alone it’s not enough to result in any significant weight loss. Also, if you’re adding sugar to the tea you’re pretty much negating the extra calories burned anyway. Supplements-There are some green tea supplements out there, mostly marketed for weight loss. As always, it’s better to eat real food (and drink real drinks) than to take a supplement as there are complex interactions in whole foods that cannot be duplicated in supplements. Also, they could be dangerous. Most green tea supplements contain a fair amount of caffeine which may cause jitteriness and there have been cases of liver toxicity with green tea extract supplements. It’s also unlikely that a green tea supplement will do much for weight loss. Bottom line-Green tea is generally regarded as safe and may provide health benefits so it’s worth incorporating into your diet (assuming you like it). Studies generally find that you need to drink 3-4 cups a day to reap the health benefits. Be careful about adding too much sugar to it since excess sugar comes with its own health concerns. Don’t expect the pounds to melt off though. Stick to healthy eating and exercise if you are trying to lose weight and think of green tea as a bonus, not a solution.